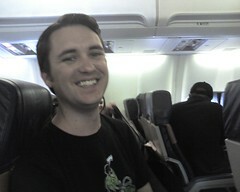 OffLine OnLine » Blog Archive » Wil Wheaton is my Plane Seat Mate! Wil Wheaton is my Plane Seat Mate! I flew to the SOE FanFaire this year and got to talk to Wil Wheaton on the way, at the baggage terminal and even sharing a cab. He’s in town to visit friends. Very very nice guy. More later! This entry was posted on Thursday, August 2nd, 2007 at 12:59 pm	and is filed under General Geek, Movies. You can follow any responses to this entry through the RSS 2.0 feed. You can leave a response, or trackback from your own site.